When Margaret MacLean, wife of first Vancouver mayor Malcolm MacLean, travelled on the CPR to join her husband on the west coast in the fall of 1886, with her on the train to Port Moody was Melville Patrick Thomson (1). 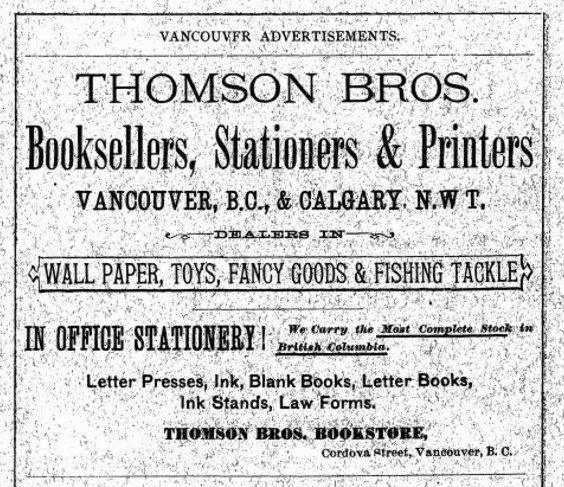 Thomson was coming from Calgary, where he and his brother, James Arthur, ran a successful bookstore called Thomson Bros. The brothers wanted to establish a branch in Vancouver, and by October 1886, they were in business at 46 Cordova Street. Born in what would become the province of Ontario—James in Belleville in 1858 and Melville in Erin in 1860—the Thomsons apprenticed in a bookstore in their home province before following the CPR west on an ambitious expansion to new markets. They opened their first bookstore in Portage la Prairie, Manitoba, in 1881, the same year the CPR arrived and the town was incorporated. Next up was Moose Jaw, in the future province of Saskatchewan, where they opened a store just as the railway opened access to the town. 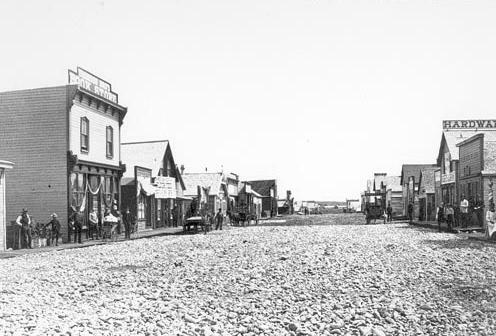 Then, in 1884, they expanded to Calgary, within a year of the railway’s arrival (2). 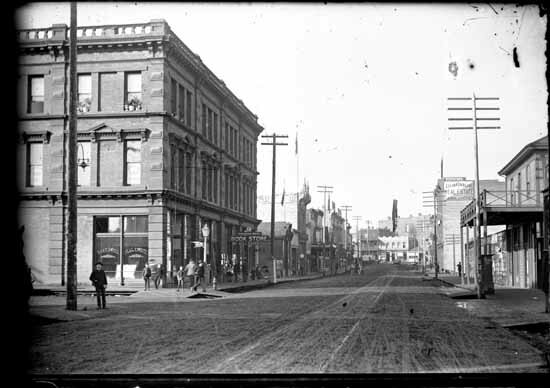 And now here they were, in the fall of 1886, setting up shop in the CPR’s soon-to-be terminus of Vancouver, just down Cordova Street from booksellers S.T. Tilley and British Columbia Stationery and Printing (later the BC Book Store). Thomson Bros. seemed to do well in Vancouver from the start. “We can recommend our readers to pay a visit to the well-filled bookstore of these enterprising men,” read a notice in the San Francisco Journal of Commerce, British Columbia Edition. “Here they carry an excellent line of books and stationery, making quite a feature of their commercial books. Ledgers, cash books, journals and stock books simply line their shelves. They do a considerable business as news agents and carry also quite a line of toys and fancy articles” (3). In April 1888, the brothers moved to larger premises at 108 Cordova near the corner of Abbott, sharing half the space with Davidson Bros., jewelers. Six months later, Davidson Bros. moved to a different location and Thomson Bros. took over the whole store (4). In addition to selling books, stationery, and fancy goods, the company expanded into job printing in 1889. By September 1890, the new line of business was deemed to be “one of the most complete in its fittings in the Province. The type is of the latest style and the work they turn out is of a high order” (5). “Such success as they have achieved is proof of the enterprise and push of the firm and their ability to keep pace with the widening demands of this rapidly growing city. Their stock is thoroughly metropolitan in its variety and extent…Few business undertakings have met with such unqualified success and none has more fully deserved it” (6). While Melville oversaw things in Vancouver, James took care of the Calgary operation (the Portage la Prairie and Moose Jaw branches were eventually dropped), and the firm continued to grow in both cities. In Calgary in 1893, the company put up the three-story sandstone Thomson Bros. Block that still stands on 8th Avenue SE (7). Meanwhile, in Vancouver, they returned to 108 Cordova. They also established a branch in Nelson, BC, in the mid-1890s. In 1896, the Thomson brothers, together with Melville’s wife, Marcella, formed the Thomson Stationery Company with a capital stock of $75,000 (8). The new firm took over Thomson Bros.’ existing businesses in Vancouver, Nelson, and Calgary. I’ll pick up the story from there in the next post. (1) Major James Skitt Matthews, Early Vancouver, Vol. 2 (Vancouver: City of Vancouver, 2011), 248. After disembarking in Port Moody, passengers destined for Vancouver had to take a steamer to complete their journey. The CPR line through to Vancouver was completed in May 1887. (2) “The History in Thomsons Restaurant,” on Thomsons menu, retrieved March 28, 2017; The New West (Winnipeg: Canadian Historical Publishing, 1888), 133; Thomson Bros. ads in Portage la Prairie Weekly, Moose Jaw News, and Weekly Herald (Calgary). (3) “Thomson Bros.,” San Francisco Journal of Commerce, British Columbia Edition (March 1, 1888): 11. (4) “Thomson Bros,” Vancouver Daily World (September 11, 1890): 4. (7) Alberta Heritage Survey Program. (8) Canada Bookseller and Stationer (July 1896): 14; The Miner (May 23, 1896): 3. Hello Lana, my name is Eunice Robinson, and I am the President of the British Columbia Genealogical Society. I’d like to talk to you about your book on the Thomson Booksellers, and whether you would be interested in giving a talk to the BCGS membership at our February meeting – the 2nd Wedesday – in the evening. My phone number is 604-596-2811. I would love to do this. I’ll give you a call to chat about it.